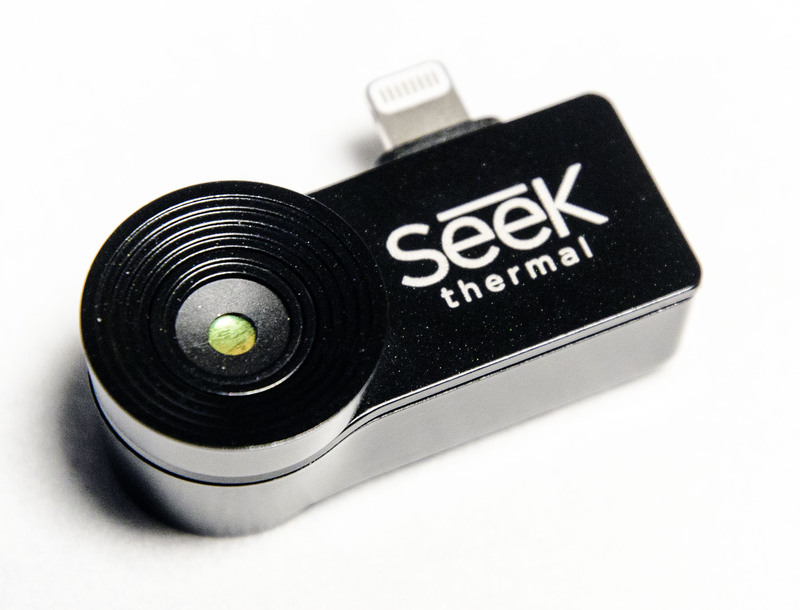 I’ve recently been using the Seek Thermal Compact IR camera sensor to shoot photos of graphics cards under load. I received one of this nifty devices after being a beta tester, but it languished on a shelf for months. 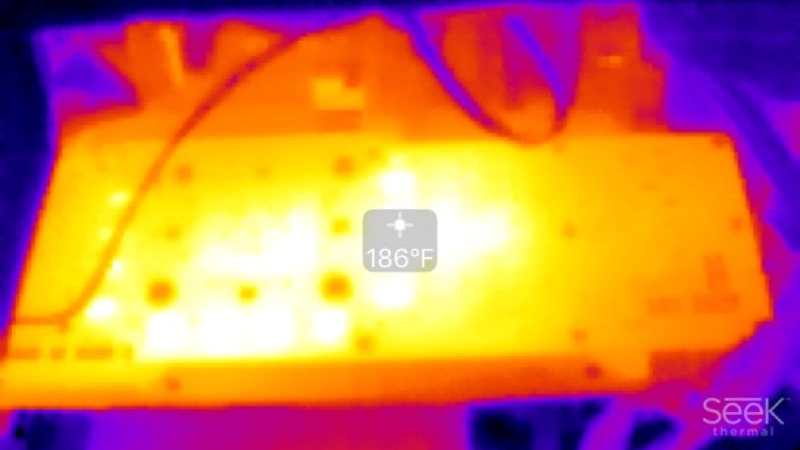 I recently dug the device out and used it to capture thermal images of graphics card under load. 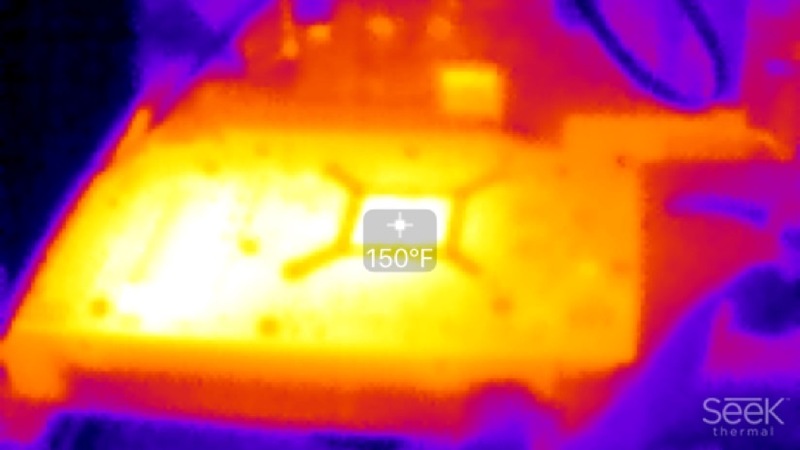 What follows is by no means a rigorous assessment of GPU thermal patterns, but it’s certainly interesting to take a look at what the thermal output “looks” like. The Seek compact uses a 206 x 156 pixel autofocus sensor which also captures temperature data in either Fahrenheit or Celsius with a stated range of -40 degrees F to 626 degrees F (-40C to 330C). The iOS version I use attaches to the phone via a Lightning connector; the Android version uses a micro-USB connector. Seek requires an app, which you download for free; the list price of the Compact is $249. The app can shoot still images or video and can select the color palette, which I just left at the default orange-red setting. The app also scales the images up to a more useful 824 x 464 pixels. Despite the relatively small size of the resulting images, you can still pick up definite patterns. I captures these images while running the Rise of the Tomb Raider benchmark at 4K with 4x MSAA and all the various graphical quality settings maxed out. 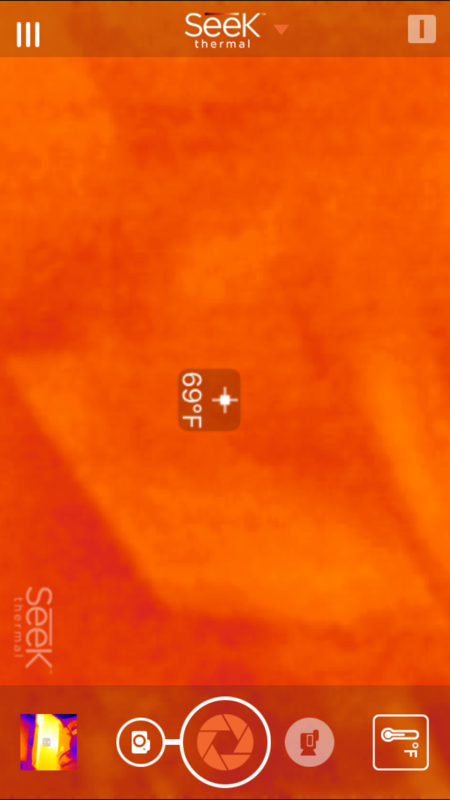 I did attempt to capture the thermal images at roughly the same time in the benchmark, during the second scene inside an enormous cavern with running waterfall. I shot these thermal images looking at the back of the card, so not all images will be equal. For example, some of the Nvidia-based cards include a back plate which spreads out the heat a bit more than a bare PCB. While I attempted to collect a temperature reading at the hottest point, this is just a momentary capture in time. I may shoot thermal video capture another time. So with all these caveats in mind, let’s take a look at the images. I present these in order of oldest to newest GPU. You can see the vent holes in the back plate. The GPU looks like it’s right under the hottest spot. 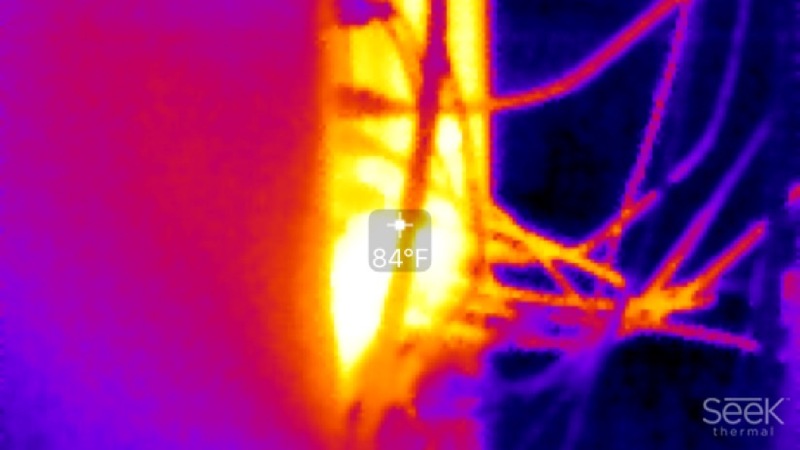 Curiously, the heat pipes you see in the lower right seem to not carry much heat. The 186 degrees F represents the hottest temperature I saw while capturing these shots. However, the Titan X lacks a back plate, so this is the rear of bare PCB. While 145 degrees F looks pretty hot, what’s interesting about this temperature is the location. 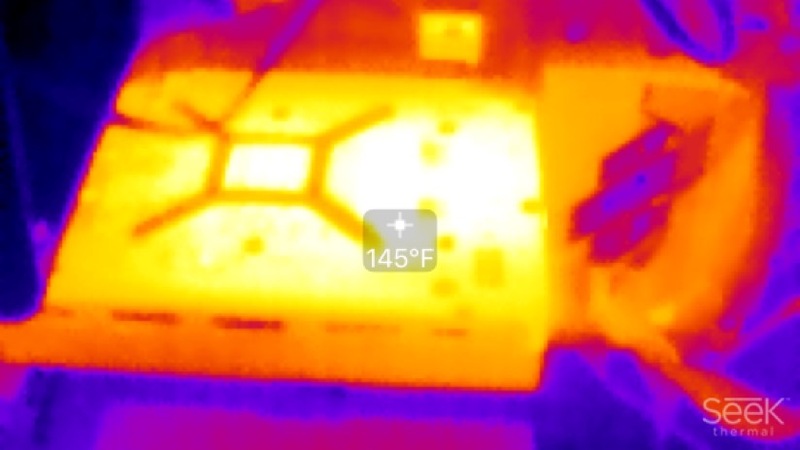 The hottest thermal reading wasn’t at the GPU mount point, but offset a bit. 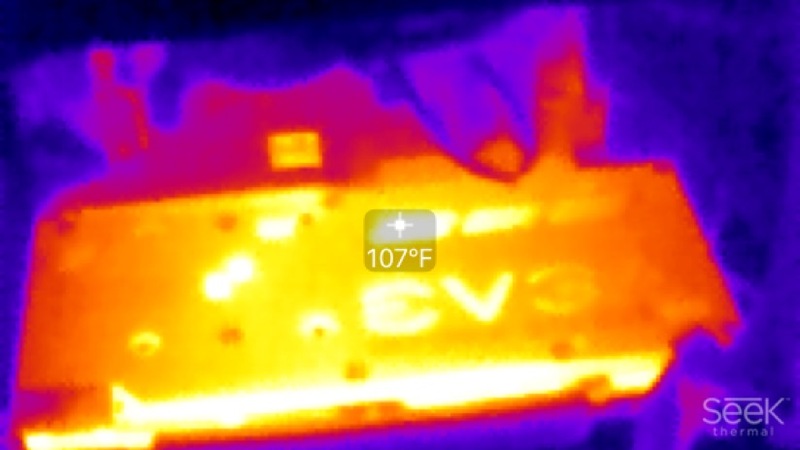 The eVGA logo and three oblong hot spots above the logo show how these spots are screens built into the back plate, allowing some heat to dissipate out the rear. This slightly overclocked card doesn’t seem to get all that hot. Even the bright spots at the bottom are actually cooler than the recorded temperature above. The RX480 gets pretty hot, but only about as hot as the Fury R9 Nano. Bear in mind that the temperature shown is on the bare PCB; the RX480 doesn’t ship with a back plate. 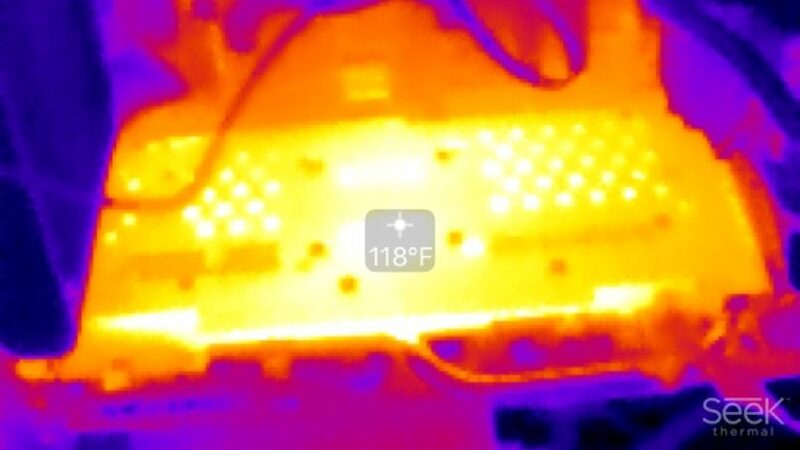 I don’t have a thermal image of the GTX 1080 board, but I do have an image captured of the rear of the card when running under load. The GTX 1080 Founder’s Edition blows air out the rear of the case. So that 84 degrees F represents the temperature of the air coming out the blower — not too bad, really.